Trump tried to reassure Kim, but instead ended up reminding him why he needs his nuclear weapons. We’re less than one month away since the scheduled meeting between U.S. President Donald J. Trump and North Korean leader Kim Jong-un on June 12 in Singapore. As of Thursday, the summit appears to be in serious jeopardy. Events remain in flux, but the summit’s fate started to turn on Sunday, when U.S. Secretary of State Mike Pompeo and National Security Adviser John Bolton made a set of comments that were closely observed in Pyongyang. Pompeo outlined a confusing and divergent set of objectives for the summit while Bolton, true to form, emphasized the salience of the so-called 2003 disarmament of Libya as a model for the ongoing process with North Korea. Bolton has previously referenced this model, which imposes a maximalist set of U.S. demands on North Korea. Following these appearances, early morning on Wednesday, North Korea cancelled scheduled high-level inter-Korean talks and issued a mild threat (by Korean Central News Agency standards) to the summit with Trump in Singapore. The cause for North Korea’s move was the alleged involvement of so-called U.S. “strategic assets” (i.e., B-52 Stratofortress nuclear-capable strategic bombers) in the ongoing U.S.-South Korea Max Thunder 2018 aerial exercises. The U.S. Department of Defense has denied that B-52s participated in this year’s exercise. North Korea may have determined their participation based on reports in the Japanese and South Korean press prior to the start of the exercises. Pyongyang is closely monitoring the scale of U.S.-South Korea military exercises, which have been taking place through the diplomatic process that began in February with the Winter Olympics in South Korea. Later on Wednesday, North Korea’s KCNA carried a remarkable statement attributed to North Korean Vice Foreign Minister Kim Kye-gwan, which emphasized, among other things, North Korea’s opposition to the “so-called Libya mode of nuclear abandonment” and “complete, verifiable, and irreversible denuclearization.” The statement mentioned Pompeo and Bolton’s recent statements. Kim’s statement then went on to effectively compare Trump to the U.S. presidents that preceded him, suggesting that if Trump stuck to the same precondition requirements previous U.S. administrations had demanded, the summit would be in peril. Any attempt at forcing North Korea’s “unilateral nuclear abandonment” would lead North Korea to reconsider the summit. The White House’s reaction on Wednesday was swift, with Press Secretary Sarah Huckabee Sanders noting that instead of insisting on a Libya model, Trump would “run this the way he sees fit,” referring to the upcoming summit. Combined with denials of B-52s participating in Max Thunder, that may have seen off North Korea’s early concerns and kept the summit on track, but Thursday brought a new twist. Speaking off-the-cuff at the White House to reporters on Thursday, Trump spoke on the recent summit cancellation threats from North Korea and what his national security advisor had meant in reference to a Libya model for North Korea. Trump took the opportunity to offer North Korea a security assurance in exchange for a deal, saying that under a deal, Kim would remain in power in Pyongyang. This may have been a demand the North Koreans communicated to Pompeo during his recent trip to North Korea; North Korea has long sought assurances that the United States would not seek to pursue regime change. 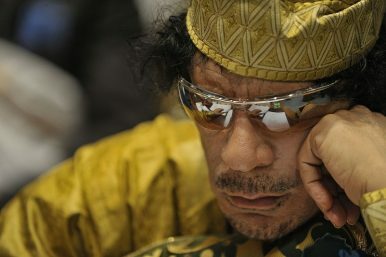 Libyan leader Moammar Gaddafi, disarmed of his nascent nuclear weapons in 2003, died at the hands of rebels backed by Western airpower in 2011, of course. Bolton’s “Libya model” and Trump’s “Libya model” are two different things; by emphasizing the latter, Trump showed North Korea that it had been right all along to be wary of Bolton’s comments. For North Korea, a Libya-style disarmament deal with the United States sets the Kim regime down the road to a painful and undignified end. Trump punctuated his Libya remarks by adding that “we just cannot let that country have nukes,” emphasizing the very maximalist U.S. position on denuclearization that Kim Kye-gwan sought to warn against in his statement. The president’s comments will serve as a reminder in North Korea of a central reason why the country pursued nuclear weapons. Like China decades ago, North Korea has long seen the United States as far too willing to use its own nuclear arsenal for coercive ends. The only way out of that coercion—the only way to maintain self-reliance and dignity—was to acquire nuclear weapons. Trump’s threats will only emphasize to Kim why he must under no circumstances relinquish his so-called “treasured sword” and open himself to suffering the same fate as Gaddafi down the line. As of this writing, North Korea has yet to react directly to Trump’s Thursday remarks, but they ultimately may end up being the straw to break the camel’s back. Instead of walking back the damage done by Bolton’s remarks, Trump amplified them tenfold. If the summit between the two leaders sinks, it may be because the president of the United States threatened to attack North Korea if it didn’t submit to a deal. The summit may end up happening yet; both Kim and Trump have their reasons for wanting a successful, historic meeting, but neither side is willing to bring its “win set” closer to the other on the issue of denuclearization. Events since Sunday suggest that they may get no closer before the June 12 deadline. The meeting marks the highest level contact between the two countries since the Singapore Summit in June.